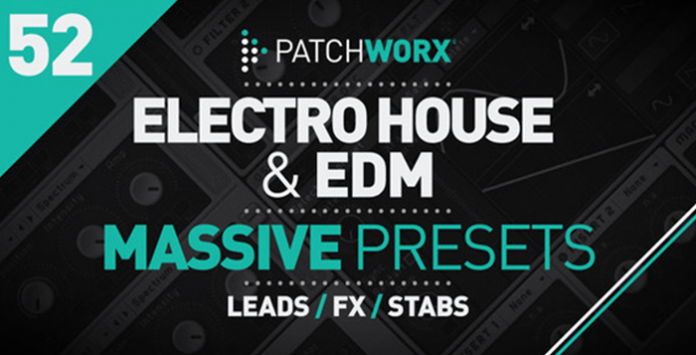 Patchworx 52 – Electro House and EDM is a powerful collection of Native Instruments Massive presets aimed at the latest styles of modern dance production featuring 32 Basses and 32 Lead Synths with fully tweakable macro controls. This boosted Patchworx pack comes complete with not only 64 custom presets and 64 MIDI files but included in the download are 64 Wav rendered versions of the selected patch and associated MIDI files, for instant inspiration. This pack has been inspired by artists including Hardwell, Dannic, Dyro, Tiesto, Sander Van Doorn, Knife Party, Dimitri Vega & Like Mike, W&W, Nicky Romero, and popular labels including Revealed, Protocol Records, Flamingo Records, Smash The House, Doorn, Spinnin, Axtone, Size, Refune, and Toolroom. Patchworx 52- Electro House and EDM is a collection of Crunchy Electro House Basses and Searing EDM lead synth sounds designed for specifically for Main Room productions created exclusively by Dom Kane for Loopmasters. Click here for free demos and to download.